St. Peter, Minn. – Gustavus Adolphus senior wide receiver Matt Boyce (Excelsior, Minn.) has been named to the 2015 D3football.com preseason All-American First Team, which was released July 24. A First-Team All-Conference and First Team All-Region performer in 2014, Boyce finished Gustavus’ 10-game regular season schedule as one of the top-ranked pass catchers in the country. Last season, Boyce finished third in NCAA Division III with 17 receiving touchdowns. His 1,196 receiving yards ranked 11th in the country while his 119.6 yards per game average ranked 10th. Boyce averaged 10.2 points per game (12th/NCAA) and 7.7 receptions per game (15th/NCAA). Boyce shattered Ryan Hoag’s 2001 touchdowns record of 14 and went over 100 yards receiving six times, which ranks second all-time. Matt’s 78 receptions rank third all-time while his 1,196 yards rank second. He eclipsed 100 yards receiving in six games and caught two or more touchdown passes six times. 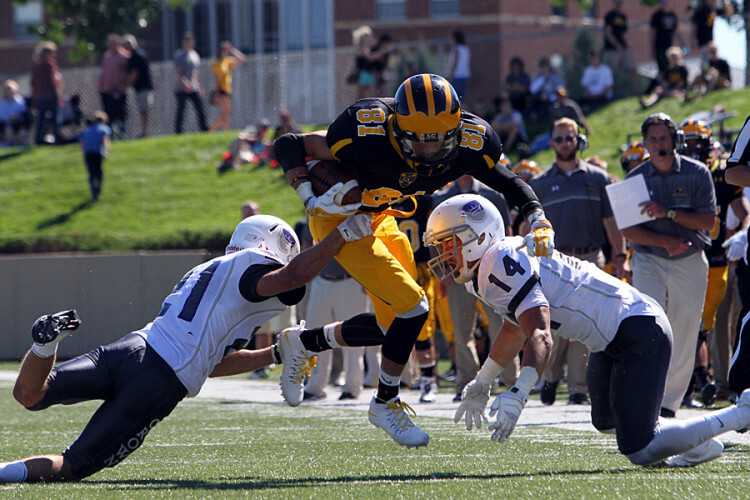 Against Crown and Augsburg, Boyce caught three touchdowns and racked up more than 150 yards. At the conference level, the Minnetonka High School product led the Minnesota Intercollegiate Athletic Conference in touchdowns and ranked second in receptions, yards, yards per game, and yards per catch. Boyce is one of four receivers to be named to the preseason All-America Team, joining Roman Namdar of Mount Union on the First Team, as well as Second Team members Joey Sonnenfeld of Augsburg and Zach Culvahouse of Wittenberg. Along with Boyce and Sonnenfeld, running back Sam Sura of Saint John’s University also represents the MIAC.